As your providers of pediatric dentistry and orthodontics in Chapel Hill, NC, we at Clifton & Mauney, are more than glad to give you the utmost in care throughout the entire orthodontic process, from beginning to end. You may be overjoyed and ready to celebrate in anticipation of your orthodontic treatment ending when your braces finally come off, but we have to warn you that your orthodontic treatment isn’t quite over just yet. You’ll then move into the retention phase, a critical stage in the orthodontic process. Retention is the final stage of orthodontic treatment. During this phase, you’ll wear an orthodontic appliance known as a retainer. While the purpose of the orthodontic treatment was to shift your teeth into a more favorable position, the purpose of the retention phase is to maintain this new position of your teeth. Without the usage of a retainer, your teeth will likely shift back into their previous suboptimal positions. Thankfully, by using a retainer, you can keep your teeth from moving and maintain your new, beautiful smile. At Clifton & Mauney, we offer three different types of retainers, each being effective for certain types of orthodontic situations. Hawley Retainers – This retainer is a thin, tongue-shaped piece of acrylic that’s molded to fit your mouth and uses a wire to hold your teeth in position. 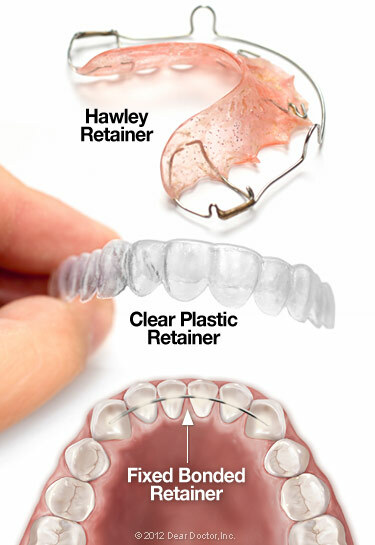 The Hawley retainer is simple, durable, easy-to-remove, and also capable of correcting minor tooth movements. If you like, you can even personalize it by choosing different colors and designs for the plastic arch. Clear Aligners – This is similar to the Invisalign tray system. Like the Invisalign trays, these retainers are custom-made of thin, transparent plastic that’s designed to precisely fit over your teeth. The main advantage of these retainers is that they’re practically invisible – there’s no wire to show and others won’t even be able to tell that you’re wearing a retainer. However, they’re not as durable as the Hawley retainer and they aren’t recommended for patients with some conditions, such as teeth grinding. Fixed Retainers – This type of retainer, as its name implies, isn’t removable by a patient. Like lingual braces, they use a wire that’s bonded to the tongue side of the teeth and provide a completely discreet treatment. Fixed retainers can be recommended when there’s a higher risk that teeth will revert back to a previous, unfavorable position. Typically, most people will adjust to wearing a retainer after a short period of time. You may find it a little harder to talk normally at first and you may also produce a bit more saliva than usual, but these effects will generally fade away after a day or so. In order to keep your retainer fresh and germ-free, you’ll need to properly clean your retainer. While you can gently brush a Hawley-type retainer with your regular toothbrush, that same brush may scratch an aligner retainer. For removable retainers, you should use denture (or special retainer) cleaners. Fixed retainers are best cleaned by brushing and flossing. If you need help flossing, we recommend using a floss threader or a proxabrush. Finally, if you have a removable retainer, always remember to take a retainer case with you. Whenever you take your retainer out, make sure to put it in its case. You’d be surprised to know how many retainers end up accidentally discarded! Contact Your Chapel Hill, NC Orthodontist Today! If you’re looking for orthodontics or pediatric dentistry in Chapel Hill, NC, we encourage you to give us a call at (919) 933-1007. If you have any questions, please don’t hesitate to contact us. We hope to hear from you soon!